Information Traveling east on Route 16 to Canso, turn right onto Union Street. Driving past the hospital, turn right into Wilmot Subdivision reaching the parking area at the top of the hill, where signs clearly mark the trailhead. A short walking loop around a saltwater/freshwater estuary, a 43-m (139-ft) bridge over Chapel Gully, and a full 2- to 3-hr hike along the shoreline and through beautiful woodland. 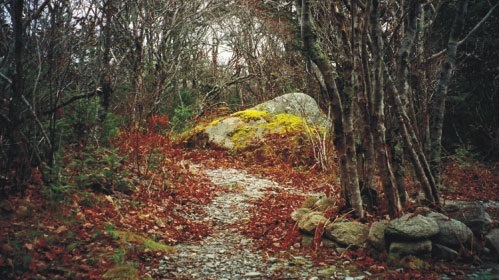 The trail system is a short walking loop within a larger hike. An interpretive panel at the trailhead will help you in your choice of route. Beginning your hike, through aromatic spruce, you will soon reach a small clearing where a path to each side allows you to complete either loop. The branch to the right leads you to the base of the gully along the salt marsh, incorporating a look-off tower which offers a view of Glasgow Harbour and inlaying areas. Soon along your path, you will have the option of following the shorter loop back toward the gully and thus to your point of origin, or of continuing with the longer hiking route toward the shoreline and through beautiful woodlands. By choosing the longer route, you also will be treated to the quaint and picturesque “French Cove”. Here you will find picnic and rest areas overlooking the clear-water sanctuary where many people choose to take a refreshing dip. Following the edge of the gully, this loop soon connects with the inner trail where you will be guided along natural pathways outfitted with squirrel and bird feeders. Crossing a 43-metre bridge, over the inflowing sea water, you may spot marine life such as crabs and snails.